Adobe offers a wide range of products and services at incredibly low prices in Australia. These Adobe promo codes expire soon, so don’t forget to bookmark this page now. New Adobe discount: Students and teachers can buy Creative Cloud from Adobe and save 70% on your purchase. Latest Adobe promo code: Pay A$9.99 per month for Creative Cloud Photography including Photoshop, lightroom and much more. Limited time Adobe coupon: Get Acrobat DC for desktop, all new mobile app and other services from A$14.99 per month. Seasonal Adobe deal & sale: Accelerate your business and cut risk with e-signatures by Adobe Sign. Buy Business Adobe Sign plan for A$30 per seat per month. Adobe free delivery offer: Get Creative Cloud All Apps including after effects, Premiere Pro and much more from Adobe at just A$49.99 per month. 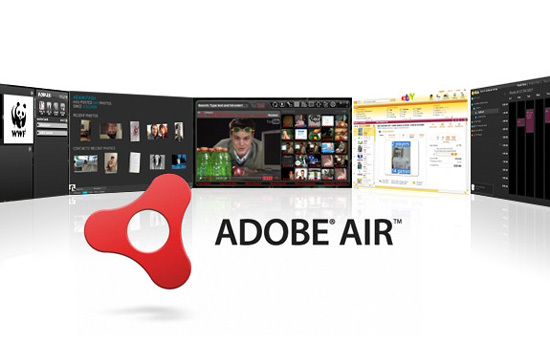 Exclusive Adobe voucher codes: Download free Acrobat Pro DC for your desktop and enjoy 30 days free trial only at Adobe. Adobe is an American computer software company. It began its operations in 1982 and has since spread across the globe. The company’s focus is on multimedia and creativity software, with its most famous product being the image editing software, Photoshop. The majority of Adobe employees still operate in the US, in San Jose where the corporate headquarters are located. Yet, the company’s products are available in countries across different regions. Adobe has won a number of awards over the years, among others it was chosen as the most outstanding place to work by Fortune. Adobe is truly an international company and you can enjoy the products from all over the world. You can find it operating in almost all corners of the world and you can pick your country from a range of options. You can view the platform in countries such as: Denmark, Portugal, Indonesia, Brazil, the US and the UK. Adobe has a large online community, which is a great place for finding tips and help on your Adobe experience. You can find it from the main Adobe website under the Forums section. The community has sections for specific products as well as information on new product launches and items. 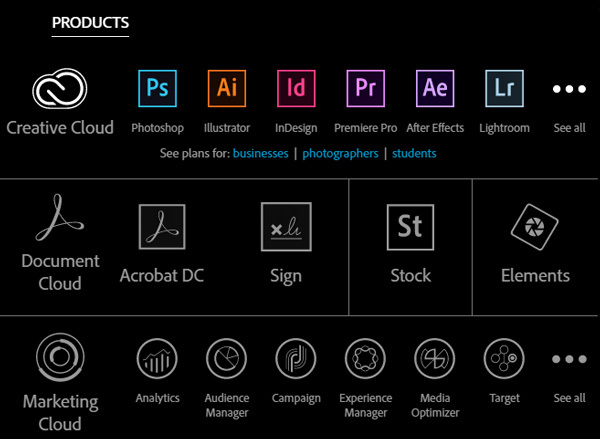 Creative Cloud: Photoshop, Illustrator, InDesign, Premiere Pro, After Effects, Lightroom & more. Document Cloud: Acrobat DC, Sign, Stock, Elements and more. Marketing Cloud: Analytics, Audience Manager, Campaign, Experience Manager, Media Optimizer, Target & more. 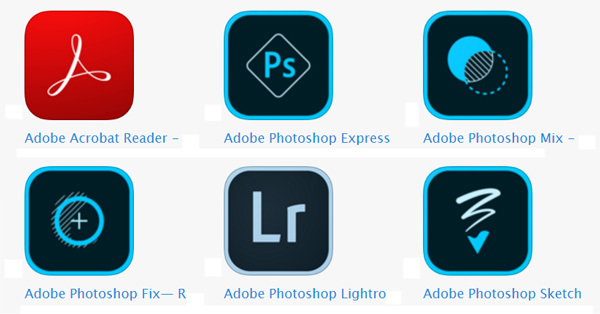 You can get plenty of help for picking the right items at the Adobe platform. You can view the products based on your use, whether you are an individual, student, a business and so on. This helps you get a selection of the products suitable and specifically designed for your use. You can also browse the items based on your needs, such as photo editing, website design or marketing, for example. Looking for exciting deals and discount codes on computers & software? Check out exclusive section on our site and help yourself to save big. Creative Cloud Photography plan $11.99 per month. Save 70% on Creative Cloud. If you go to the Products page, you can find a section for Special Offers. This page is the perfect place to find out about the latest product deals and offers. It might include additional tools for your existing products or tempt you to trying out an Adobe item without paying a full fee from the start. Looking for secure data service? Purchase Trend Micro’s cloud security solutions with 30 days free trial option or Kaspersky AntiVirus. You can make further savings at Adobe with the help of discount codes. Simply conduct your shopping as usual and once you are done adding all the products to your shopping cart, you can head down there. Click the Cart and on the front page, you’ll find a text field for Promotional Code. Enter your code and click Apply. You can then either continue shopping for more or click the Checkout button. Adobe has plenty of customer support options available for you. You can find information about the products, how to install and use them and different ways to solve any technical issues you might have. You can find information on the Learn & Support section. The section has how-to guides and popular troubleshooting guides and information on how to contact the customer service team if your problems persist. Adobe’s products are also available on mobile phones. You can find apps for software like Adobe AIR, Adobe Capture CC and Adobe Connect. All the available software apps can be found from the Adobe website under the Mobile and Devices section. The apps are generally available for Android, Windows and iOS phones and tablets. Since the products on the Adobe platform are either in the cloud or downloadable as a digital format, you won’t need to worry about delivery. The product will be available for download right after purchase and you can access it with your sign in information from anywhere in the world. If you’d like to return your product and receive a refund, you must contact Adobe customer service and follow their instructions.